Regular car maintenance is probably the single thing you can do as a car owner to keep your ride happy and save money on repairs in the future. 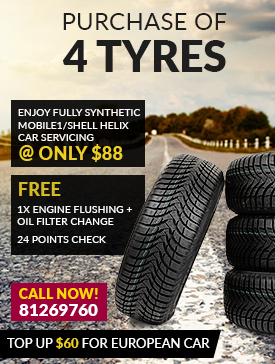 Contact our friendly staff @ 81269760 Max Lim today ! Every 12 months / 10,000km , whichever comes first. Drain and Replace of Engine Oil for All Car Makes. - Selection of preferred engine oil for ALL car makes. - Prices quoted below are inclusive of parts replacement. -Most Japan/ Korea car only requires 4L engine oil. -European car that requires above 4L will be charged at $22/L. Choose Your Prefered Engine Oil. 12. Inspect operation of air conditioner.